Travel to Alberta in winter is a wonderful experience. The air is crisp and clear, the sky is blue, and the sun in shining. Sure, temperatures dip below freezing, but that gives you an excuse to cuddle up by the fire with your sweetie and enjoy a romantic night in after a great winter adventure. 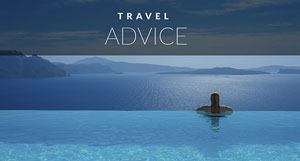 From Banff to Canmore, Lake Louise to Sunshine, we've got you covered. 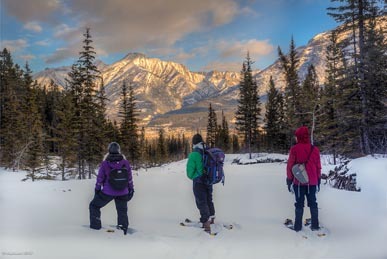 We know that travel can be difficult to plan, so we thought we'd put together an itinerary of the 9 Best Winter Activities in Alberta that you can do too! 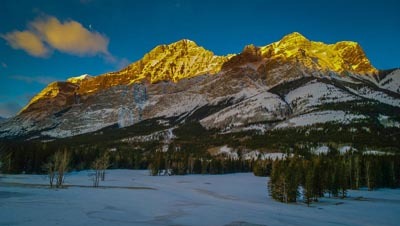 We had the chance to do some amazing adventures in Alberta over the holidays and we want to share them with you. We saw nearly everything, and had the perfect blend of taking part in epic adventures, enjoying relaxing days, and of course fitting in some romance too. For a little inspiration, we've put together the perfect Alberta winter vacation itinerary for you to explore and experience the best of the Rocky Mountains, enjoy! 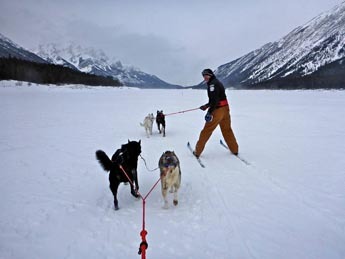 Banff National Park is filled with incredible winter adventures. 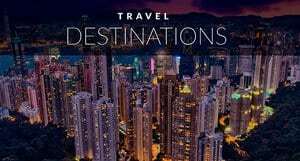 From trekking to the backcountry, cross country skiing, enjoying the downtown vibe of Banff Village or doing so many of the activities listed below. 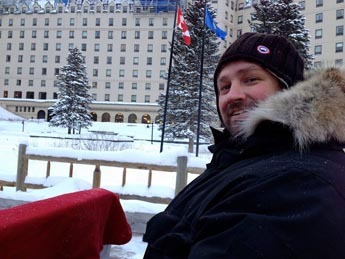 Need a place to Stay in Banff and Lake Louise? Check out our round up of the best Hotels in Banff. 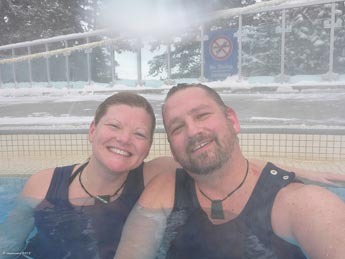 Rent yourself an old fashioned turn of the century swim suit and hop in to the uber hot Banff Hot Springs. When you are finished head over to Cave and Basin just a little lower. Home to the original hot springs in Banff, it's Canada's Oldest National Park and the third oldest National park in the entire world! There is a very cool cave to walk through to look at the original entrance that was discovered in 1885. 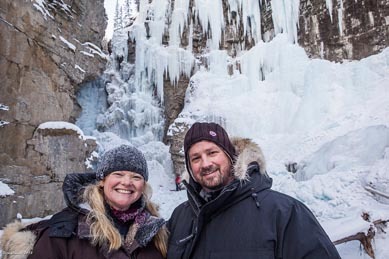 For beautiful winter scenery and an enjoyable day outdoors, visit the Johnston Canyon Ice Walk. The Johnston Canyon Ice Walk takes you on a journey through a deep limestone canyon on a steel catwalk anchored to the walls. This two and a half mile walk takes you through six different frozen waterfalls and a deep pool of swirling water that is reached by walking through a stone arch. The upper canyon waterfall is a must so make sure you go to the end of the line to see it all. Imagine sitting outside with a pack of Wolfdogs. 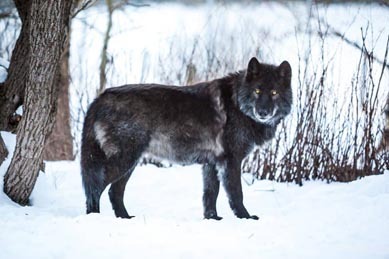 The Yamnuska Wolfdog Sanctuary is a rescue centre for abandoned or neglected Wolfdogs near Canmore, Alberta, and it is working hard to promote responsible wolfdog ownership and preserving wild wolves in their natural environment. It's an incredible experience and was probably one of the most magical moments we had during all our time in Alberta. This is an activity not to be missed. Skijoring is a fun winter sport invented in Norway where cross country skiers are pulled along by a horse, tractor or even snowmobile. Over time it’s been modified to where skiers can be pulled along by just about anything and during our time in Alberta, we were pulled by sled dogs. 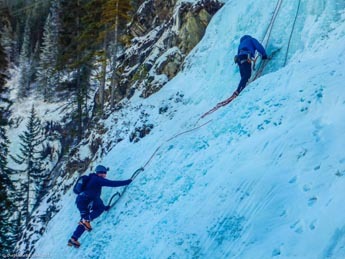 Don't miss trying out ice climbing in Alberta if you visit in the winter. Who wouldn't want to scale a frozen waterfall? 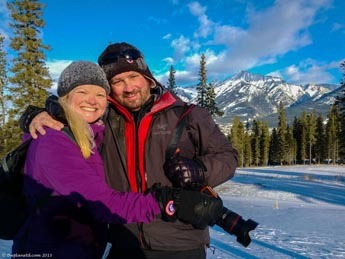 Just fifteen minutes from Lake Louise Ski Hill and just a short walk to Lake Louise and the Fairmont Chateau Lake Louise, this is an excellent spot to base yourself during your Alberta Adventure. There's fine dining, a rooftop hot tub, an outdoor ice bar and plenty of space in this rustic yet elegant location. With 4200 skiable areas in one of the largest ski destinations in North America, this is not to be missed. There are trails for all levels of Skiing and Snowboarding. 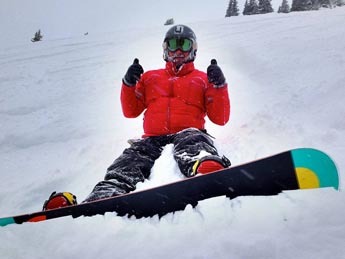 Experts can explore everything from endless chutes and remote bowls to chutes and gulleys in some of the Rockies' most challenging terrain but beginners can feel confident that there is a green run down from every chair lift. Lake Louise is on the World Cup Circuit with a Terrain Park and a Snowcross Course. There is nothing more Canadian than strapping on a pair of skates and hitting the ice. 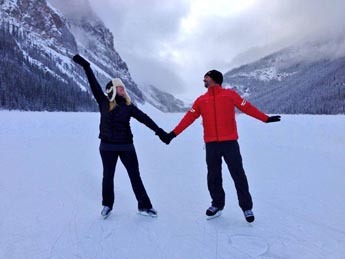 The Fairmont rents skates for everyone, and anyone can skate on the frozen lake. They even clean it off every day with a zamboni and there's an ice castle too! The Fairmont offers daily sleigh rides leaving from the front of the chateau and it takes you up the trail to the mouth of the glacier. As you ride along the trail with a blanket on your legs cozied up to the one you love, you feel as if you are in a movie as you take in the extraordinary view. 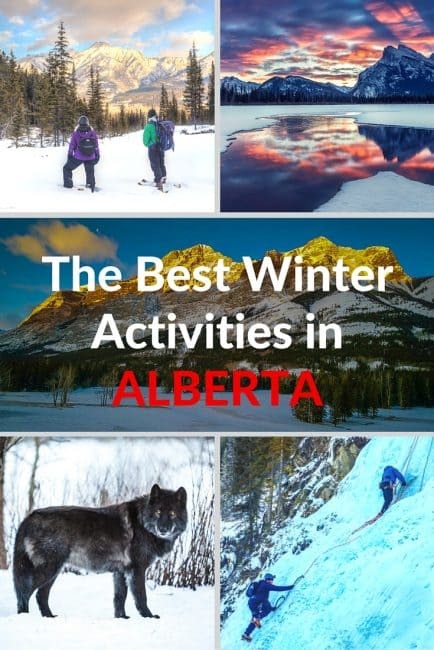 7 Responses to "9 Best Winter Activities in Alberta"
We will go in Alberta for a week in February and I am wondering if you recommend any travel tour operator . We will only have a week and we would like to plan in advance to be able to enjoy! Thanks Ben! 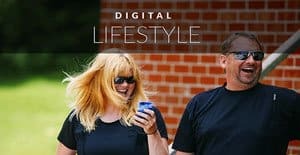 I hope you get the chance to give some of these activities a try! I just got back from Jasper last night and what a blast it was! It was my first time snowboarding, and I loved it. Definitely can feel it today in my legs and arms (weirdly enough). Looks like you two had fun in Alberta. Looking forward to reading about your next winter adventure. Wow Wonderful! 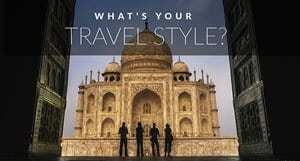 best Winter Adventure itinerary ever – with a dash of romance too, couldn’t ask for anything more! 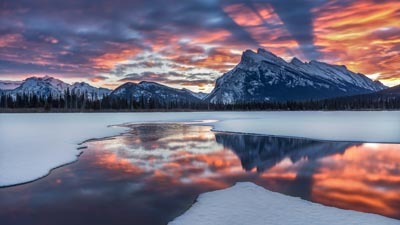 the hot spring looks very very inviting for the winter and that picture of the Rockies looks absolutely breathtaking – do add more pictures would love to see some more of Alberta’s promising beauty!